The project is located in the southwest corner of Wuyuan Bay, which is adjacent to Wetland Park in the north and Lakeside Reservoir in the south. The building area is about 330,000 square meters. The planned total number of beds is 1,380 beds, including 1,000 beds for acute beds and 380 beds for acute late care beds. Numerous service installations are composed into the architecture furniture, this makes the healing spaces full of active service spirit, it makes also ready for the future raise of the human cost. The most important thing is that the users can feel from the architecture, the best ambassador of the hospital ,the feeing of the care. Isn’t it the essential of the healthcare environment? Care unit. We have designed a list of services that hospitals can provide through construction and furniture. According to the needs of hospitals in different periods, these services can be achieved through the addition or reconstruction of furniture. 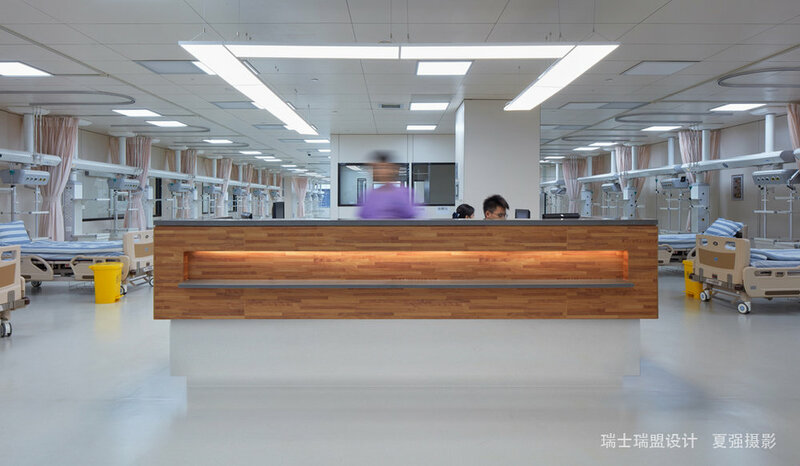 According to the actual situation and operational needs of Hong’ai Hospital, tailor the indoor services it needs most at this stage and optimize these requirements based on factors such as operation, cost, and market. The content of these services is translated into the architectural language and implemented in the main representative space within the hospital, forming guidance for the design of interior construction drawings. The design of the outpatient main corridor makes full use of the small-scale area outside the structural pillars, and integrates a series of active service and automatic service-type institutional settings, using diagonal and modular lines to make the original straight traffic-free corridor The road became active and formed a medical street full of services. The entrance to each major medical area here is clearly defined by body mass and color, which can be clearly seen from a distance. The emergency department is divided into two parts: general emergency treatment and severe emergency treatment. The nurse station located between the general emergency and critical care departments will be able to take care of the arrival of the two people. Access to the critical emergency department from the north side is not disturbed by the general emergency department. The design of the emergency hall is both open and practical, and it relieves tension through a small amount of indoor landscape. The use of semi-transparent glass in the design of the emergency clinic creates a sense of public service while safeguarding the privacy of the consultation room. It also facilitates the communication within the emergency room.